Gender neutral facilities provide important restroom and locker room access for people of all gender identities, as well as for people with disabilities who are assisted by someone of a different gender, and for parents and caregivers with children of a different gender. Additionally, at Western and under Washington State law, everyone has the right to access gender-specific facilities according to their gender identity. 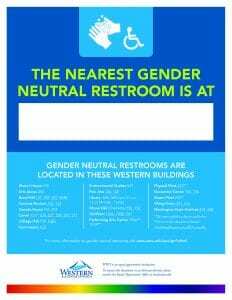 Since 2012, Western has worked to increase the number of gender neutral facilities on campus. In 2016, the University adopted and began implementing Guidelines for Gender Neutral Facilities that were developed by a committee of students, faculty, staff and administrators. On an ongoing basis, the Equal Opportunity Office and Facilities Development and Capital Budget share responsibility for implementation of the Guidelines. 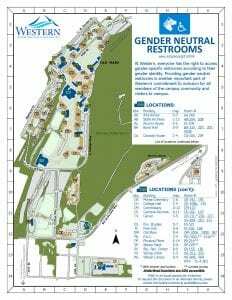 Today, at least 54 gender neutral restrooms are located in 26 campus buildings. Most recently, during winter break 2018-19, a gender neutral restroom was created on the fourth floor of Miller Hall. As of September 2018, a new gender neutral restroom is now located in Wilson Library 182 and is available all hours the Library is open. What was previously the family locker room in the Recreation Center is now a gender neutral locker room. Additionally, gender neutral restrooms were recently created in Mathes, Nash, and Birnam Wood Commons, and are available to people with access to those buildings. The renovation of the Carver facility, completed in August 2017, included creation of four gender neutral restrooms, a single-occupancy gender neutral locker room on the first floor, and another gender neutral restroom with a shower on the third floor. The image used for Western’s gender neutral restroom signs was created by a former Western student during her time working in the AS Publicity Center.